Hey guys! 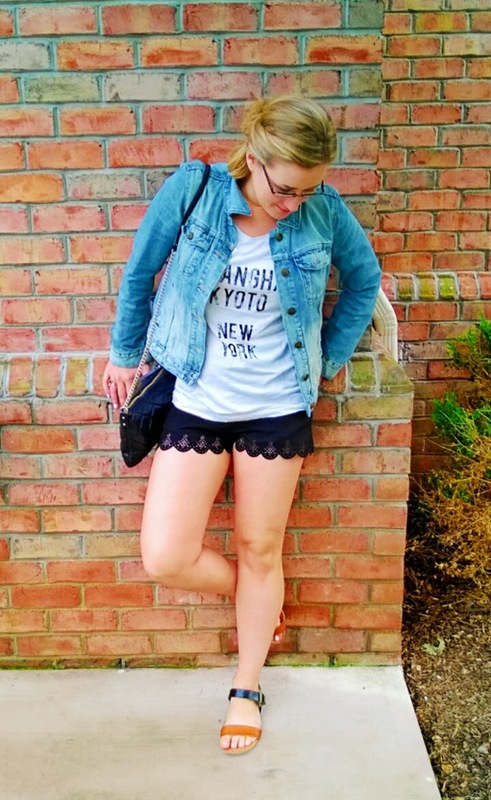 I decided to share with you one of my favorite casual looks for August. It's super comfy and has some really cute details that make it fun! My sandals have this awesome snake print on them that's really unique, and the laser cutout shorts make me feel fancy any time of the day. It's an outfit that's quick to put together for those days you don't want to put much into your outfit. 1) Fabric/ Materials - A lot of fabrics are more cozy to wear than others. We wouldn't be caught wearing leather pajamas for a reason! Some of my favorite comfortable materials to wear are fleece and cotton. My least favorite is wool. Times a thousand!! 2) Style & Fit - The fit of the clothing can really help an outfit feel laid-back. I like to generally try and include one loose or over-sized piece into my comfy outfits. If you wish to wear jeans search for ones in a boyfriend style. Just remember to keep one piece oversized and the rest of your outfit more fitted. This keeps your look balanced, instead of frumpy. What is your least comfortable fashion memory?